The designer calls this chair “Fully Loaded”, and says it’s a ‘unique dichotomy of comfort and demise’. 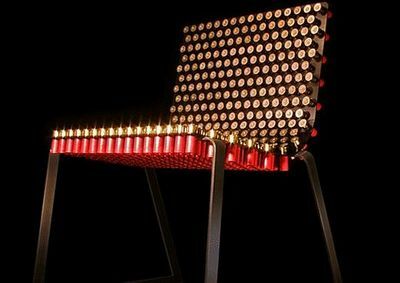 It’s made of 388 shotgun shells, already fired, sadly. You can pick from black, green, blue, red and copper shells, and the brass is covered with a coat of varnish to prevent tarnishing. The chair is currently being built to order. No word how much it costs, but I suspect we’re not talking tens of pounds here – more like hundreds. 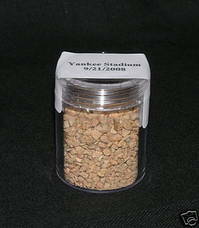 If you’re (a) American or (b) Japanese and are into baseball, you may be tempted to get yourself a “vial of actual infield soil taken from Yankee Stadium” – yours for around $70. If you&apos;re desperate to spend $37,000 dollars on a chair, then look no further. Even if only because you&apos;ll struggle to find many others at that price. This is the Matrix Unplugged chair, and if you&apos;re excited about the name, you&apos;ll be ecstatic when you hear that the chair was fashioned out of the prototype of a nuclear submarine. Sadly, there&apos;s no nuclear technology on the chair itself, although it does boast motorized hydraulics to enable you to get into a perfect sitting position. And if that&apos;s not enough for your $37,000, the designer of this one-of-a-kind chair, Zoran Milivojevic, will customize it in any colour you like, if it doesn&apos;t quite match your existing furniture. Although the red does go rather nicely with that picture in the background.